Creation House’s Anti-Islam Booklist: Why Scrub Terry Jones? It’s fairly straightforward that Strang would choose to distance itself from Jones, though other writers whose images have been burned in effigy, as Jones’s was on Monday in Afghanistan, have likely seen their sales rise. Still, it seems especially disingenuous to hide the book away at this point. The content is no different this week than it was last week, and seems to be in line, at least in tone, with the publisher’s other titles on Islam. Computer scientist Eric Colburn and geneticist Alana McKinsey make a shocking discovery. While working on National Geographic’s genographic project, they uncover Muslim researcher Dr. Alomari’s plot to co-opt the program so he can prove that Ishmael is Abraham’s rightful heir. Can Eric and Alana stop him before his plan inflames the Muslim world to destroy Israel? 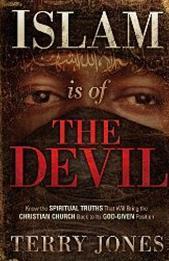 Copies of Islam is of the Devil are apparently still available from Jones’s Dove World Outrearch Center in Gainesville – it looks like it may end up being a rarity. Unlike the Koran, despite Jones’s efforts.